Well known Fill-Rite Fuel Transfer Pumps meet your stationary and mobile fuel transfer pump needs with a variety of AC, DC, hand pumps, flow meters and accessories for most applications. Tough. Reliable. Long-lasting. 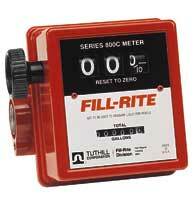 Fill-Rite Hand Pumps deliver fluids quickly and easily. Whether you’re transferring gasoline, oil, diesel, even residual water from your tanks, select from a variety of Fill-Rite hand pumps. You’ll appreciate the trouble-free performance of these rugged hand pumps. Cost-effective high-performance Liquid Flow Meters for industrial, commercial, and municipal service. Our flow meters are used in batching, blending, process control, and dispensing of liquid products in all liquid-handling industries.